Is an app really enough? We were asked to provide data collection on attendees of PGA Tour events by driving app downloads so the organization can offer better sponsor value and targeted customer experiences. But we also noticed a deeper problem: focus had drifted away from what fans want to what sponsors want. 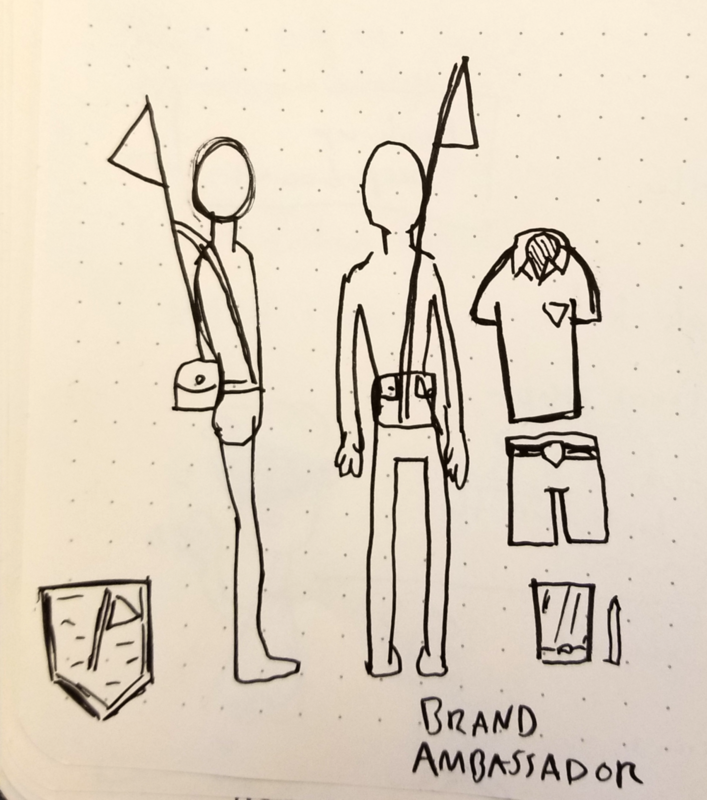 To find the win-win for fans and sponsors, we went back to the drawing board. We discovered that a live golf event is more like a city than a stadium. PGA Tour has been chasing trends in sports apps, but golf isn’t like other sports. There’s no single focal point, no fixed seats, no predictable crowd flows. So we took our inspiration from the services that address pain points in cities and other large-scale conglomerations of people. 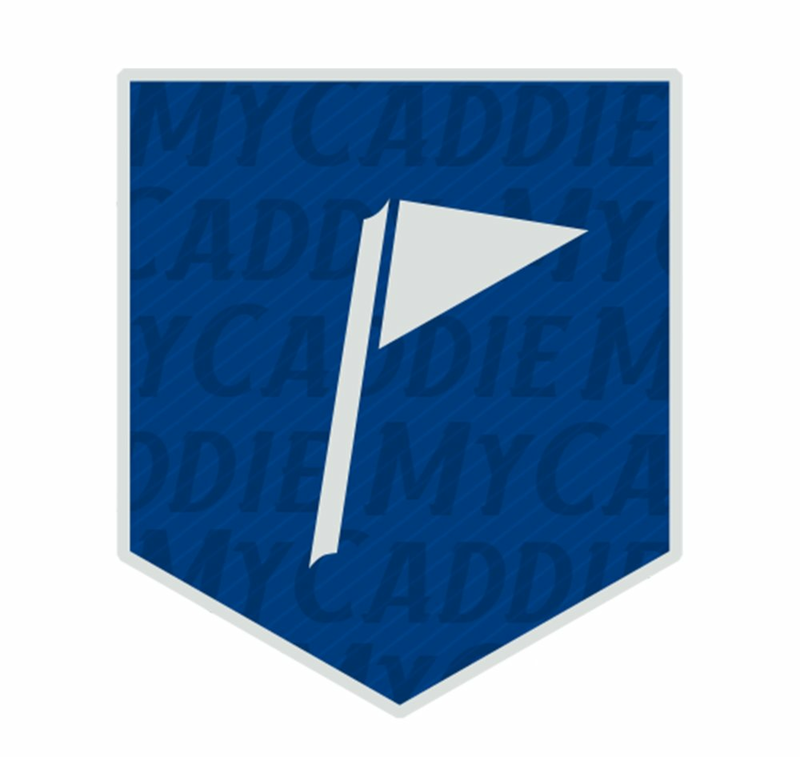 MyCaddie is a service concept which collects digital and physical tournament experiences under one umbrella, with one important guiding idea: to use data to inspire confidence and provide personalized journeys. Your Buddy Who’s Been There Before. Just like visiting a new city, golf events are better if you can go with somebody who’s been there before, who knows all in ins-and-outs: the best sightlines, routes, food spots, rest areas. Customers who purchase their tickets directly through the PGA are automatically registered for MyCaddie, and sent this welcome kit containing their RFID wrist band, a map of the event, sunscreen, sunglass holders, and any other collateral the PGA Tour or its charitable partners want to share. The first 100 sign-ups, however, will be the coolest pros on the course when they receive this RFID visor instead of the band. 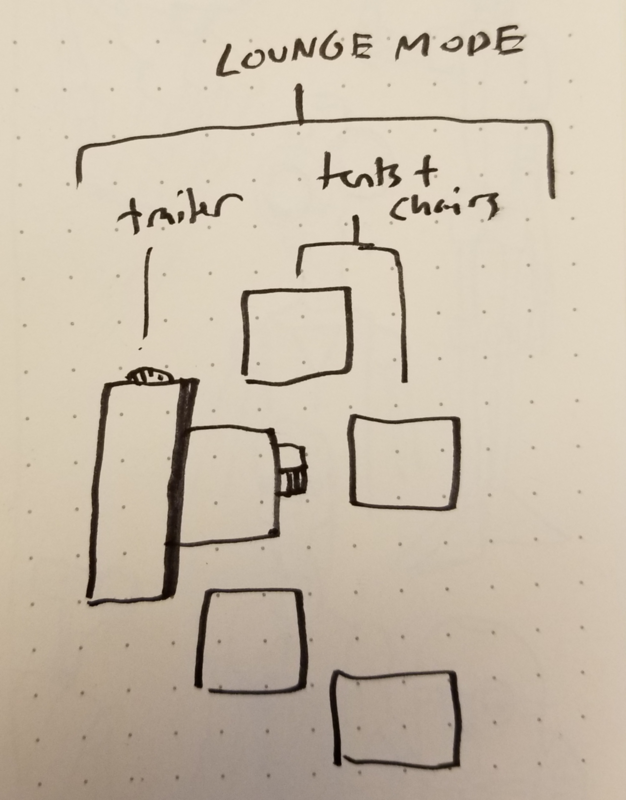 Control MyCaddie with a tip-of-the-cap! 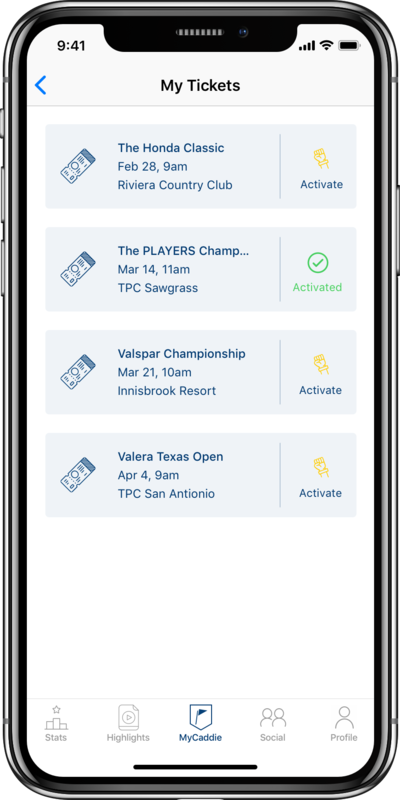 These screens show the new MyCaddie section of the existing PGA Tour app and the band activation feature within ticketing. The MyCaddie hype wagon will head into markets ahead of PGA Tour events, setting up in metro areas, at festivals or farmers markets, anywhere our audience is going to naturally congregate. Fans have the opportunity to register their tickets with our brand ambassadors and get their MyCaddie wristbands, but also hang out, listen to live music, try out sponsor products with the golf simulator, and get pumped for the event. This fits into our post-event and off-season strategy as well. This is a year-round asset deployable to get people excited about coming tours, sell tickets, or assist at sponsor or charity events. Event signage and brand ambassadors promote the perks of the MyCaddie service to attendees and provide an opportunity for conversion. 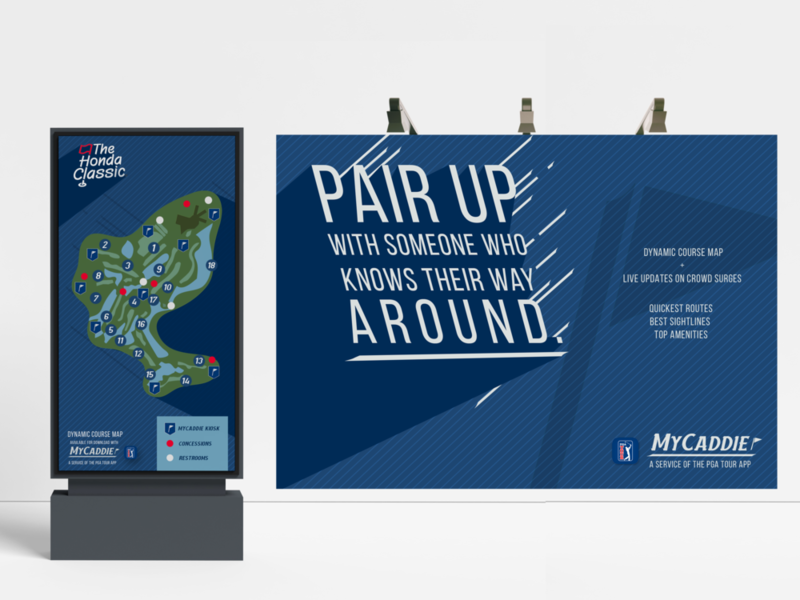 MyCaddie adds new wayfinding options to the PGA Tour app. 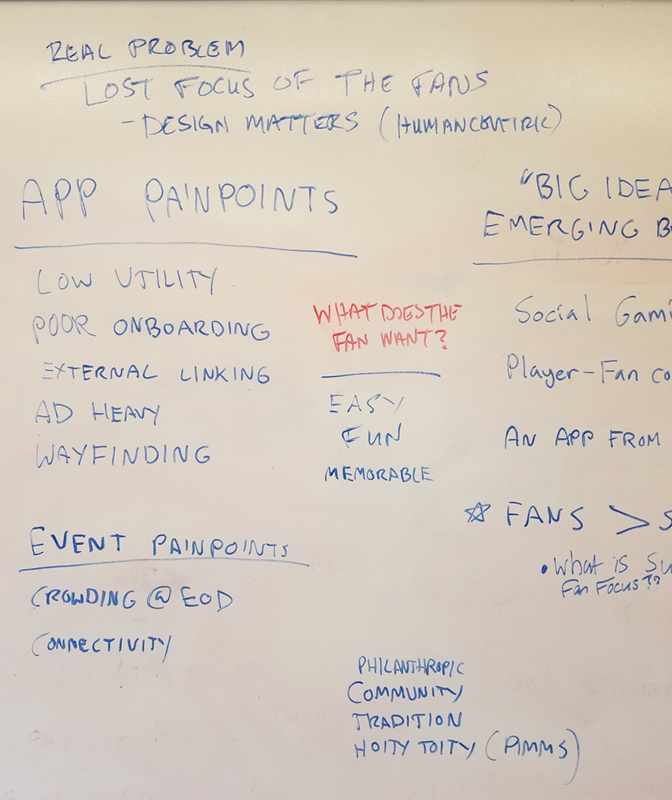 A dynamic heatmap, fed by data from other app users, shows live crowds as they form, allowing users to decide if they want to avoid the crush, or chase the excitement. Sightlines further allow users to plan their movement, showing viewing angles they may have missed. The spread-out nature of golf events creates natural pain points over basic human needs, especially food. But there isn’t one solution. Some attendees enjoy wandering the grounds, walking from hole to hole or following a favorite golfer. But others prefer to post up at one hole, and don’t want to stray far from the action to go find amenities. For those who don’t want to venture far from their favorite spot, our team designed insulated food lockers. For a small fee, orders are delivered to the lockers via scooter, and the customer is notified to come pick it up by tapping their RFID band to the locker. Each food locker is named for a famous pro caddie, not just to delight fans, but to assist in location for delivery personnel and customers. To skip the delivery fee, customers can opt to pre-order and pick up the food, skipping the lines to pay with their wrist band. Our user had a great time at the event, but we don’t want our relationship to end there. When they leave, they’ll get this scorecard email. Because we have data on how they enjoyed the event, we know what they are likely to have missed, and offer it to them in a recap. Amazon’s GameOn API adds a layer of prizing and gamification to the app. Each swipe of the wrist band, each purchase or hole visited, puts the user into tiers of sponsored prize packages. GameOn allows the PGA Tour to offload prizing infrastructure to Amazon’s network, shipping items right from their distribution centers. Maybe it was never about the golf.